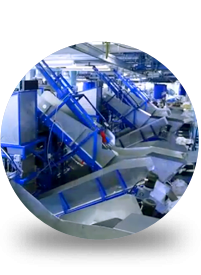 These systems were designed to improve efficiencies while sorting clean linen by operators, prepare controlled weight lots of linen and brought these lots in an automatic vertical bagging machine with a capacity of up to 300 bags an hour. Improve operator efficiencies by placing the material so the pieces could be easily identified by the operators before sorting. While before the operator had to sort linen in jammed lots. Allows better working ergonomics for the operators with the bin positioning used to assist operators. Offers working cells to allow the operator to focus on the task at hand with a controlled flow of material. Reducing handling of the delivery linen bags from the clients to the laundry, inside the laundry, and returning to the laundry. Water, chemicals and electricity savings, no longer the need to clean each linen bag. Savings on the purchasing of linen bags and their replacement when they are damaged. Reducing the head count required for sorting and bagging because of the efficiency gained with automation. Material handling systems to corrugated cores manipulation. 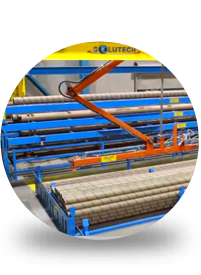 This system is used to automatically feed two automatic core cutting machines, It allows 3 different diameter cores to be picked up automatically moved over a 40′ distance into a Solutech automated stores. Handles corrugated cores up to 208” long. Adapted to customer’s electrical standards GE PLC and interface operator, ABB drives etc. Automatic versus manual insertion of cores. Previously, two persons were needed for this operation. Stopped machine break down and winder stops due to none conforming cores, since now the system can detect these situations upfront. Improved core supplier’s quality, by detecting upfront issues. Complete operation with state of the art safety norms compliance. This machine was made to dispense automatically caps and direct them towards the automatic capping machine. The caps are first sorted in order to be all in the same direction, than directed into a chute to arrive in a controlled manner into the capping machine. 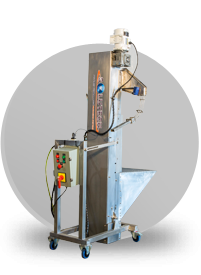 Solutech built this machine using stainless steel, it meets FDA requirements and is very easy to clean.